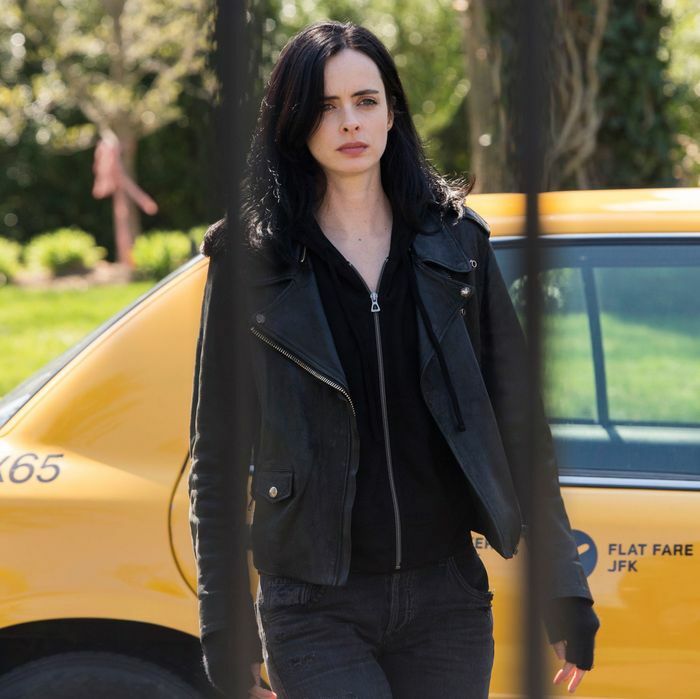 Season two of Marvel’s Jessica Jones would make an ideal half of a double-feature with Logan, provided you had a big bottle of antidepressants on hand. Besides the neo-noir stylings and the choice of a bitter, sarcastic, hard-drinking loner as its protagonist, Melissa Rosenberg’s Netflix drama gets closer to realistic psychology than most superhero stories, to the point that watching the first part of the new season becomes an endurance test. This is one dark show. Good, but dark. And slow, mainly because it’s more interested in people’s emotional interiors than in moving the plot along as quickly as it can. The rusty-razor-blade one-liners and drunken misbehavior only contribute to the despairing feeling. I’m not trying to scare anyone away, just making sure everyone knows what they’re in for. Watching it returned me to some of the darkest places I’ve ever been. The first season climaxed with our superstrong titular heroine (Krysten Ritter) killing her tormentor, Kilgrave (David Tennant). The beginning of season two is about the damage wrought on Jessica’s psyche by the act of murdering another human being. Her drinking has gotten worse, which is saying a lot, and she rejects any form of assistance or even empathy. She’s also weighing the question of whether to delve deeper into her primal trauma, the loss of her parents and brother in a car wreck. Her adoptive sister, former child star turned radio host Trish Walker (Rachael Taylor), is airing a series of investigative shows on superheroes, and her reporting has uncovered evidence that scientists genetically tampered with Jessica’s body after the wreck. Jessica has to decide whether to open that door to her past — a classic visualization of repressed trauma — or stick with her personal status quo, which isn’t great. Other characters are dealing with miseries of their own. Duplicitous attorney Jeri Hogarth (Carrie-Anne Moss) was attacked by her own wife last season when she was under the influence of Kilgrave, and witnessed her subsequent, violent death. Now she’s caught in her own parallel spiral of self-destruction that includes increasingly arrogant and incompetent behavior at work, self-immolating drug use, and sexual encounters. Meanwhile, Trish was traumatized by season one’s events as well, and her dedication to investigative journalism is partly a response to feeling as if her life is out of control.